CCS Principal Maylanne Maybee writes:This is the second week of my first LDM! 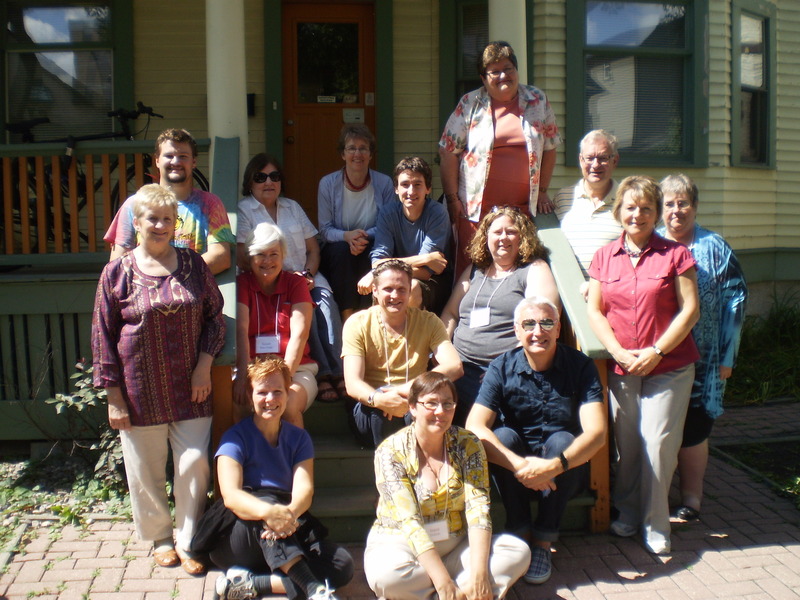 Fourteen students signed up for the August course at Woodsworth House in Winnipeg: ten women, four men; seven from the United Church, four from the Anglican Church, three from other traditions (Mennonite, Lutheran, and non-denominational). I have been apprenticing with Ted Dodd by sharing the facilitation with him while he takes the lead on the parts that require more experience. The course or “module” begins with helping students discover what kind of learner, personality, and leader they are. It makes them more aware of the diversity of learning styles, personality types, and leaders that are in the room – and in the larger world! From day one they become aware of differences, and the choice to see diversity as a gift and to respond with respect and acceptance. This awareness is put immediately to the test as students are assigned to teams –to lead worship, facilitate discussion, consider case studies, learning spirals, and faith journeys, even make coffee, bring snacks, and clean up. They then go on to practice the skills that go into team work: giving and receiving feedback, setting goals, planning presentations. Interspersed with team planning and “student led” presentations are sessions on expansive language, theology, biblical interpretation, and critical thinking. And squeezed in between are optional introductory sessions for students planning to into the Diploma program. What do I notice? The remarkable skill and creativity that have gone into the program design; how tired the students get; how much insight and learning can go into such a short period of time; the extraordinary range of gifts and experience each student brings. And above all, the qualities that go into diaconal leadership – collaboration, mutuality, team work, service, principles of adult education. Each LDM is special in its own way. I will never forget this one because it was my first! Also because in the middle of it I had to move my apartment (within the same building). Last Friday a group of students came over to help me move clothes, books, food, dishes, small items of furniture – at the end of an EXHAUSTING day and an EXHAUSTING week! The true spirit of diakonia shone through! Thank you CCS for the quality of leadership you instill. And thank you, fellow learners in the LDM, for who you are, what you bring, and what you will be come. Blessed be. Previous: Previous post: Look up. Look WAY up.